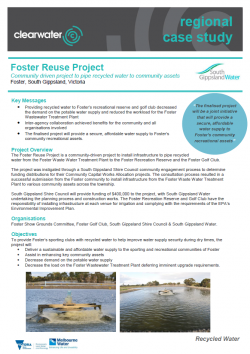 The Foster Reuse Project is a community-driven project to install infrastructure to pipe recycled water from the Foster Waste Water Treatment Plant to the Foster Recreation Reserve and the Foster Golf Club. The project was instigated through a South Gippsland Shire Council community engagement process to determine funding distributions for their Community Capital Works Allocation projects. The consultation process resulted in a successful submission from the Foster community to install infrastructure from the Foster Waste Water Treatment Plant to various community assets across the township. The finalised project will provide a secure, affordable water supply to Foster’s community recreational assets. Foster Show Grounds Committee, Foster Golf Club, South Gippsland Shire Council & South Gippsland Water. South Gippsland Shire Council Community Capital Works Allocation project provided funding of $400,000. 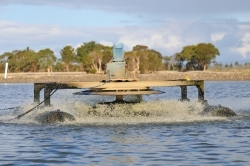 South Gippsland Water will undertake upgrade works for the Foster Water Waste Water Treatment Plant to ensure consistent re-use quality. Foster Show Ground Committee and the Golf Club will meet irrigation infrastructure and regulatory commitments.